If you’ve ever been out camping with your whole family you’ll know that things can get stinky. If you cooked a tasty dinner last night, the lingering smell next morning isn’t quite so good. There might also be a big pile of laundry sitting around, creating a musty smell. You want the RV or camper to be a pleasant space to spend time, but bad smells can quickly make you want to head back out the door. Wouldn’t it be so easy to just get your hands on regular car air fresheners? They should be strong enough, right? However, you might want to rethink your scented-solution. Here’s why. Can I Use A Car Air Freshener? In short, yes. If you really want to use a car air freshener you can. But before you do, you might want to consider a few more suitable options. The market is full of air-freshening products. And all are designed to cover up strong, unwanted odors. Let’s take a look at some of the most popular kinds. As time has moved on, so has deodorizing technology. Plug-in air fresheners usually have two variants — the first type, for the home, is plugged into an outlet which heats the liquid content. But since there is no power outlet in your car, the plug-in will typically be attached to an air vent. Then, as you turn on the AC or fan, the fresh scent will be spread throughout the vehicle. Auto plug-ins are often filled with gel, rather than liquid. Plug-ins consist of a liquid mix of fragrances and essential oils with a certain amount of isopropyl alcohol. The liquid evaporates in the air, where it will stay for a certain amount of time before the scent fades away. Gel products usually come in a few varieties as well. Beads are one of the most popular choices. 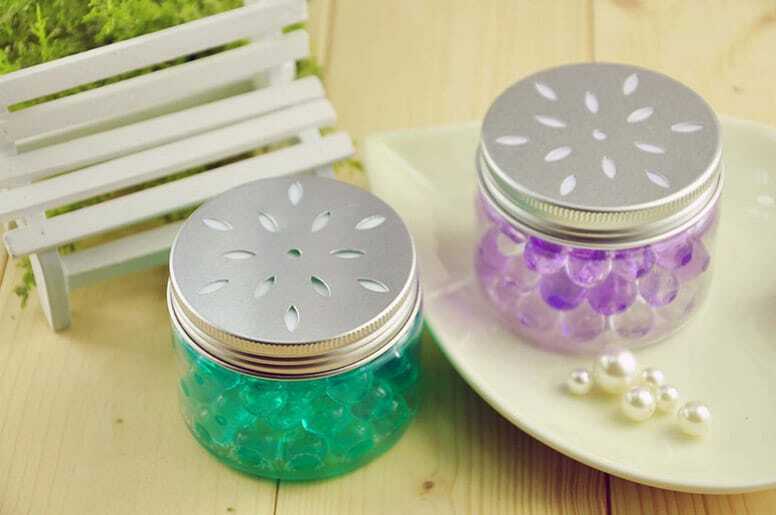 The tiny balls of fragrance slowly evaporate over time, giving you a very long-lasting odor cover-up. Though these work for a long time, they can also be dangerous, especially, if you have children or pets. The beads might look tasty to a young toddler, so make sure they are kept far out of reach. These are the typical air fresheners you see hanging from an automobile’s rearview mirrors. They’re pieces of scented cardboard, often shaped like a tree, or any other object, depending on the brand. Hanging air fresheners can be really strong at first. It’s advisable to only expose about one centimeter per week, gradually removing the packaging. Air fresheners have been around for decades, helping homeowners to cover up bad odors before guests arrive. The first kind of freshener was an aerosol. These come in a can or spray bottle. As they are sprayed, they create a fine mist that lingers for a while. Before buying any kind of air freshener, read the label to see if it’s made to cover up and remove odors or simply spread a pleasant scent. The ones that cover up or eliminate odors will often contain harsh chemicals. Remember that your RV is a closed space. Spraying a bunch of air freshener droplets into it could make you and your family vulnerable to illness from potential chemicals. If you suffer from allergies, such as asthma, this is even more hazardous. If you have children, it is vital that any product is kept far away from where the kids might be able to reach it. Air fresheners may increase indoor air pollution. In confined spaces, they can even pose a health risk, if you’re exposed for long periods. A VOC, or volatile organic compound, is a chemical that quickly turns into a gas or vapor when at room temperature. VOCs and secondary pollutants have been linked to ongoing health issues. Keep in mind that even products marked as “organic” could still contain as many hazardous chemicals as the regular ones. In 2011, a study showed that the average number of different VOCs emitted by products such as air fresheners and detergents was 17. This is a natural, organic compound, usually found in products consisting of limonene. However, it quickly becomes a secondary pollutant when exposed to air. If small amounts are inhaled, the body will usually break the chemical down and get rid of it. But prolonged or repeated exposure can have severe consequences. Formaldehyde is also known to be a respiratory irritant. It can irritate your nose and throat, and it may also cause lasting damage. In severe cases, it could affect your lungs. This chemical is similar to formaldehyde and may become a respiratory irritant when inhaled. It can also cause lesions in tissues and inflammation to the skin. Additionally, it can contribute toward cancer and reproductive issues. Fragranced sachets: You can buy these or make your own. They usually comprise a cloth bag filled with dried fruits, herbs or spices — lavender is a very popular choice. Diffuser: These devices will normally be filled with a fragrant essential oil. The scent will slowly be released in the air, giving you long-lasting results. Figure out where the smells might be coming from. Don’t leave full garbage bags in the RV, and definitely don’t leave bags open once you start using them. Treat your tanks with special products to eliminate bad odors. Let your RV air out as often as possible, by keeping windows and doors open and allowing fresh air to flow through, especially when cooking indoors. Clean curtains and carpets often. These are odor magnets. At the end of the day, you’re the one who decides whether or not you want to use an air freshener. But, before you do, why not try some of the tips in this article to stop odors from lingering in the first place. Did we miss anything here, how do you keep your RV smelling fresh and clean on long trips? Leave us a comment below. And please share the article for others to enjoy.